SEATTLE, WA -- Seattle-based Amazon is unveiling its first branded cargo plane, one of 40 jetliners that will make up the e-commerce giant's own air transportation network as it takes more control of its delivery process. The latest push to speed delivery of its products comes as the company ships an increasing number of packages worldwide. Amazon's parcel volume was an estimated 1 billion packages in 2015. By way of comparison, in the 2016 fiscal year FedEx delivered about 3 billion packages for hundreds of thousands of customers. Amazon has had issues with the reliability of air freight services. In 2013, it offered refunds to customers who received their Christmas orders late after bad weather and a jump in online shopping caused delays for UPS and FedEx. Analysts say it makes sense for Amazon to use an air fleet it controls as another way to get its products to online shoppers drawn to fast, no-extra-cost delivery. "They're such a big online retailer," said Satish Jindel, president of shipping consultant ShipMatrix. "There's so much volume that if you have to add transportation for yourself, why would you pay a retail price when you can get wholesale? It makes sense." 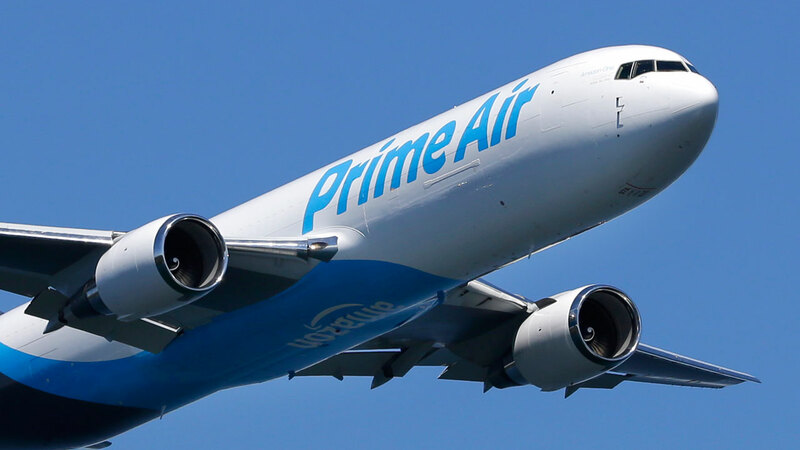 Amazon revealed its first branded "Prime Air" cargo plane, designated Amazon One, on Friday at the annual Seafair Air Show. The plane buzzed over Seattle's Lake Washington just before the Navy's Blue Angels took to the skies. Amazon leased 40 Boeing jets from Atlas Air Worldwide Holdings and Air Transport Services Group Inc., which will operate the air cargo network. Eleven of the planes already are delivering packages for Amazon's annual Prime loyalty program, which offers free two-day shipping and other perks. The remaining freighters will be rolled out in the next couple of years. Aircraft like Amazon One allow the company to "continue to maintain our fast delivery speeds and lower our costs as our Prime base and our Prime member growth continue to soar," said Dave Clark, Amazon's senior vice president of worldwide operations. Despite its growing fleet of aircraft, Amazon said it plans to continue to use FedEx, UPS and other transportation partners. "Because of our growth and the sheer amount of packages, we are supplementing our transportation needs," Clark said. The company has been furiously building out distribution centers, where workers and robots pull products off shelves and package them for delivery, as well as smaller sorting plants, which arrange packages by ZIP code for faster delivery. It has a network of more than 125 fulfillment centers worldwide. Amazon recently reported a second-quarter profit of $857 million on $30 billion in revenue. The company doesn't yet have plans to carry packages for others but says it's constantly evaluating its situation. Amazon has not been shy about competing in businesses areas far-flung from its e-commerce roots. "Once you have those planes, it certainly creates the opportunity for new products for customers," Clark said, adding: "Stay tuned and we'll see what happens in the future."